It is another Saturday, and that can only mean one thing: welcome to the Digital Digest! It's a slow early December week here, but we've got a little bit of news, a preview of Tuesday's releases, and a review of the Warner Archive release of A Flintstone Christmas Collection. Let's get going! There is always new online streaming news, it seems, and now, it is Hulu once again! Hulu recently added the current NBC series Community to their roster of series. Of course, recent episodes were always available to stream online, but now, you can view any of the episodes from the first two seasons on the website. The only new DVD news this week comes from Lionsgate, with their announcements of releases of the most recent seasons of two Showtime series. On February 21, we'll see releases of Weeds - Season Seven (DVD and Blu-ray), as well as Nurse Jackie - Season Three (DVD and Blu-ray). We'll have reviews of both of these sets as the release date approaches for them. Tuesday (December 6) is a relatively busy day for releases for many series. For traditional sitcoms, we've got The Lucy Show - The Official Fifth Season (our review) and Designing Women - The Complete Fifth Season (our review). Additionally, a DVD of a very rare series is being released with I'm Dickens, He's Fenster - Volume 1, which is only available to purchase from the official DVD website. We hope to have a review of this set soon. We've also got a new release of the series The Game, with The Game - The Fourth Season. We'll have a review of this set posted soon. Fans of The Simpsons will be pleased to know that another season of that series is coming on Tuesday, with The Simpsons - The Fourteenth Season, on both DVD and Blu-ray. Our review copy of this release has not yet arrived, but hopefully will arrive soon. Finally, Warner Archive has The Growing Pains Movie and Growing Pains - Return of the Seavers. We will have a review of these movies next week in Digital Digest. Celebrate the solstice in Stone Age style with two animated holiday classics, starring America's favorite pre-historic family--The Flintstones. Your first course of holiday cheer from Fred and company is 1977's A Flintstone Christmas, in which Fred and Barney must save Christmas when Santa sprains his ankle. There's one big problem, though - Fred promised Mr. Slate that he will play Santa at the Children's holiday party. Can Fred and Barney deliver all the toys and still make it back to the party in time? And your second course is 1993's Emmy® nominated A Flintstone Family Christmas, which gives viewers a glimpse into the later life of the Rubbles and the Flintstones. Awaiting the return of Pebbles and Bamm-Bamm (now married with children of their own), Fred and Barney encounter a criminally inclined "caveless" youth. Fred and Wilma attempt to instill values in the boy, only to find themselves with a most unexpected Christmas gift. These two Christmas specials are now on DVD for the very first time, which surprised me. You would think the 1977 classic would have been on DVD already, but it wasn't. 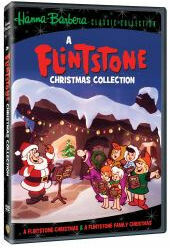 This set gives us the other two Flintstone Christmas specials, as in 2007 Warner Home Video released the TV movie A Flintstone Christmas Carol and the original series Christmas episode (which was on the season sets already). Now Warner Archive Collection has continued and given us the other two Christmas specials. Usually the 1993 A Flintstone Family Christmas is always forgotten, so we're glad this is now on DVD, too. I barely remember watching this one, so it was a treat to watch it again! A Flintstone Christmas (1977) runs 48:16 and has 8 chapter stops. A Flintstone Family Christmas (1993) runs 23:14 and has 5 chapter stops. Both are unedited! The packaging for this set is pretty standard. On the cover, we have an image from the 1977 special with Fred dressed as Santa and the rest of the gang are outside with him in the snow. On the bottom there is a mention of the two titles on this Christmas Collection set. On the back, there is a nice photo of Fred in a sleigh, along with a description of the two specials. Inside the case, it is pretty bland. There is no artwork on the panels. There is one disc and it is on the right panel. The disc artwork is the same artwork as the cover art with the franchise logo imprinted on it. The main menu isn't very exciting, but it is perfectly functional. The main menu has the same artwork as the cover art, with no music playing in the background. Some holiday cheer would have been nice? The special titles are listed right on the main menu and you select from there. There are no options for anything else, so it is simple. As mentioned, we have chapter stops on both specials and they have the correct placements. The video and audio quality of this set looks fine, for the most part. The 1993 special looks a bit better but maybe because it is newer. There are no real major problems both specials, so don't worry about it. As for the audio quality, it is clear and crisp. Unfortunately there are no subtitles or closed-captioning. The 1993 special originally aired on ABC, while the 1977 special aired on NBC originally. Nothing much else to say, it is simple and it works. There are no special features obviously on this set since it is just two specials. Perhaps maybe some promos or other archival items for these two would have been nice to have, but I didn't expect it. Christmas is near and these two specials will get you excited for the holiday even more! It is a perfect item to buy this holiday season for yourself or as a gift. I'm sure everyone has seen the 1977 special at least once, as it airs every season on television (scheduled on ABC Family). However, the 1993 one is not as seen as much, so fans will want to own this on DVD! Other than my minor nitpicks, this set works. It is simple and is just two specials, so not much was expected. For die-hard fans, you would be pleased, I think. And for casual fans or first-time watchers, you'll like what you see on these two specials. So please click the link below and buy it from the Warner Archive Collection! Fred Flintstone maybe not be your ordinary Santa, but he sure is loveable and that is always a good quality to have, especially during the holiday season. Ho-ho-ho and yabba dabba doo! Everything Lucy (everythinglucy.youns.com) - With next week's release of The Lucy Show - The Official Fifth Season, I was reminded of a website that I frequently refer to anytime that I review any series with Lucille Ball in it, a website that contains a treasure trove of everything Lucy. In fact, it is called just that, Everything Lucy. And while no website contains absolutely everything that exists in the world about any person or thing, this website does get pretty darn close. What will be of the most interest to sitcom fans are the pages about all of her individual series. You can find complete information, along with episode guides, guest cast, and video clips from all of the series on the website. There is even complete information about all of the TV specials that she produced over the years. But it doesn't end there, because as everybody knows, Lucy wasn't just a TV star. There is complete biographical information about her life, information about her fame in the radio days, and complete info on all of the movies that she starred in over the years. In short, if there is anything that you ever need to know about anything Lucy, this is definitely where you'll want to start--and more than likely, you'll be able to finish here, as well.